WAFFLES: Squawk 51! Squawk 51! Ramp Art! Ramp Art! 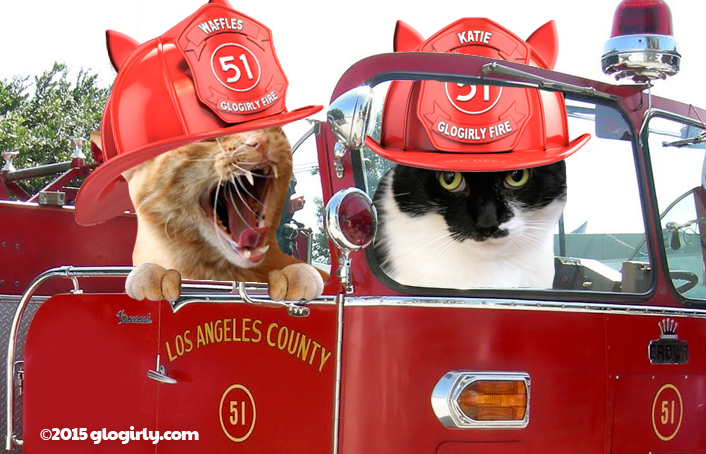 KATIE: Waffles, we're SQUAD 51. Not Squawk 51. Enough with the squawking already. WAFFLES: But what about the ramp art? What should we paint on the ramp? KATIE: Waffles, it's a good thing the 70's television people whose houses were on on fire didn't have to count on YOU to save them. WAFFLES: So Boss, where are we going? Does somebody need saving? KATIE: As a matter of fact, Waffles... there's a sweet mancat at the PAWS shelter who's been waiting a long time for a forever home. WAFFLES: Does he want to join our squawk? ... I mean squad? You know the ladies really like a mancat in uniform. SPARKLE: Why, hello ladies. I've got some burning love just for you. Do you have room in your heart for a little Sparkle? Today's Cameo Cat is Sparkle, a handsome mancat waiting for a chance at a forever home. He's outgoing, friendly, affectionate and loves talking up a storm. Sparkle prefers to sit next to you or nearby rather than in your lap. (That's exactly how Katie is! Maybe it's a tuxie thing.) Sparkle would prefer to be an only cat, but he might be all you need! He's got a sensitive stomach and food allergies and as a result is on a hyp0-allergenic diet. Sparkle was also diagnosed with Pemphigus Foliaceus - an autoimmune skin disease causing ulceration and crusting of the skin. Sparkle has severe crusting on his pawpads. Treatment is continued use of prednisolone, probably for life. But you know what? Katie is on a special diet and she also takes prednisolone occasionally. And for us, it's no big deal. Our vet "compounds" many of the drugs they prescribe which makes everything MUCH easier. That means they take what would ordinarily be a pill and turn it into a liquid. They even add bacon flavoring to Katie's. Sparkle is about 8 years old. He is neutered, current on his vaccinations, micro-chipped and has tested negative for FIV and FeLV. Sparkle is available for adoption at PAWS, Pet Animal Welfare Society in Norwalk, Connecticut. Bacon, mmmm. Now that's all I can think about. Crossed paws for Sparkle a furever loving home. 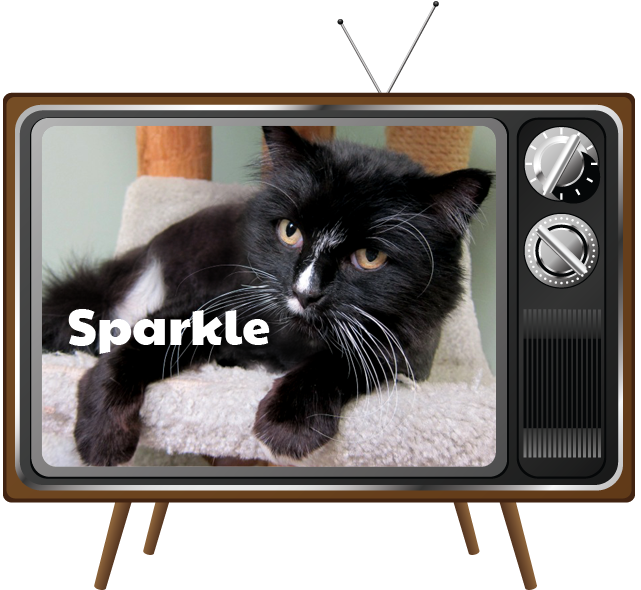 Sparkle sounds like an awesome kitty! Sparkle is very handsome! Mommy used to watch Emergency too. This looks like a great TV pilot idea. Sparkle has magnificent whiskers and a lot of catitude. Thanks for featuring him! Gee, Sparkle sounds a bit like Derby. Sensitive tummy, not a lap cat. Derby didn't have the skin issues. Go get this cat someone! Sparkle is a cutie, I hope he gets a forever home soon. Ooooo Sparkle and Waffles, our mom had some crush on some guy named Mantooth back in the day, but now she's crazy for Mancats in uniforms! We love Sparkle. Sure hope he finds his forever home soon. He's such a handsome mancat..
Now that's the kind of emergency rescue we hope goes well. Sparkle, a handsome guy like you...we can't believe you've been waiting this long to find your furever home. I love your Cameo Cats series! Good luck to Sparkle. We hope Sparkle gets a home very soon! Y'all awe adowable as always. Dat Sparkle sure is handsum. Weez sharin' and purrayin' hims finds a home soon. How could anyone resist this mancat?? He looks dreamy, and needs a special guardian to love! Good luck, sweet Sparkle! Hope you find your forever home very soon! 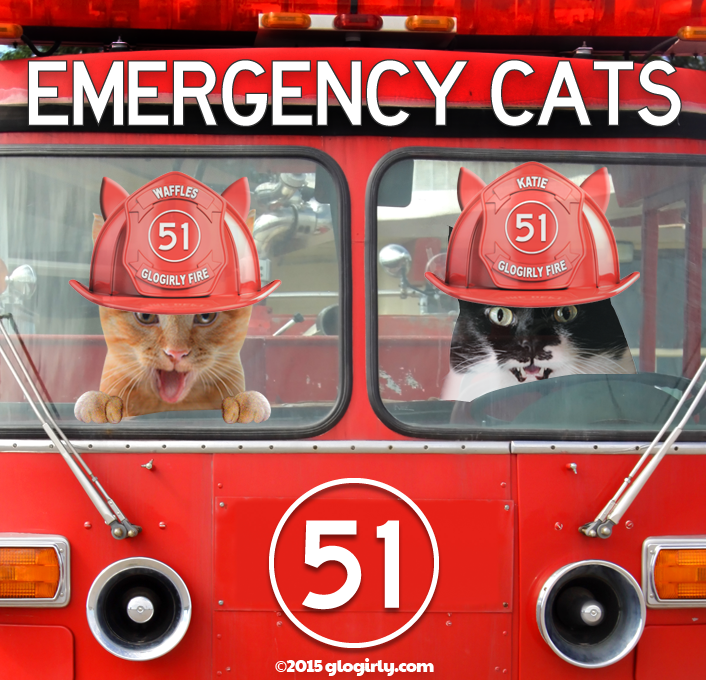 That Glogirly Fire Department sure has some great firecats! 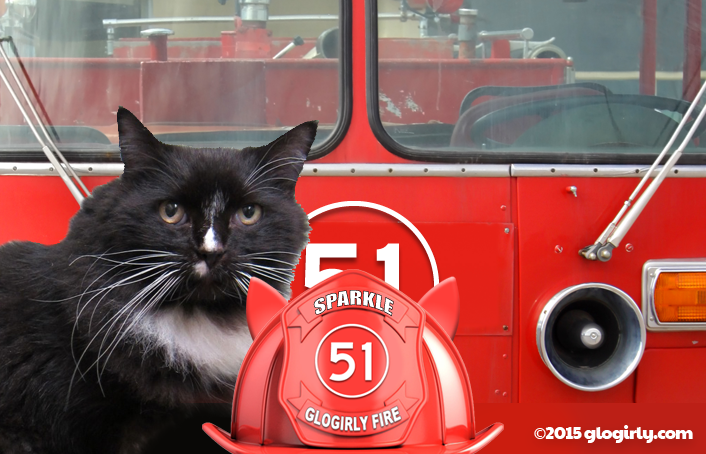 Good luck to Sparkle, he sure is a special kitty and quite handsome! Oh my GOSH! How handsome!!! Ladycats will fall under his sway inmediately. Come in Squawk 51. We have a 1013 here. Cat down! Cat down! Sparkle is a good dude, for sure. He likes hanging with his volunteer pals, and we know he will flourish in a forever home of his own. Thank you for featuring him!